RT’s camera crews have been fired upon by rioters as they tried to film the escalating violence on Kiev’s Independent Square. Armed protesters have taken control of Hotel Ukraine, trapping members of the RT crew inside. “We were just shot at. It broke a window over here. We were standing centimeters away when a gunshot hit the room where we have our live position,” RT correspondent Aleksey Yaroshevsky said, pointing to the window that had been smashed by the gunfire. 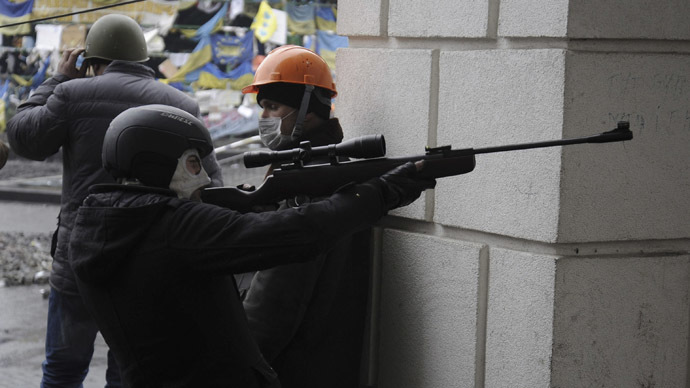 He said there were unidentified snipers firing from buildings all around Independence Square. “There’s no truce at all,” Yaroshevsky added, describing how, a few hours earlier, he witnessed rioters pushing police back from the barricades amid weapons fire.The camera team of RT’s video agency Ruptly was shot at during filming. One of the bullets grazed the bulletproof vest of journalist Danil Asimov as he stood by the window on the 14th floor of a Kiev hotel. Correspondent Egor Piskunov and his camera crew were also caught in the crossfire as they tried to film Independence Square from Hotel Ukraine. “The cameraman tried to film what was happening on the other side of the hotel and he was fired at. Thankfully they missed. As soon as they [cameramen] realized there was a bullet they dropped down to the floor,” Piskunov told RT. Our cameraman has just been targeted while filming out of the window of our hotel. 3 shots fired. Thank god they missed. Armed rioters have taken control on Hotel Ukraine and are using it as a base to fire on Independence Square, reports Ruptly news agency. Piskunov and his team have barricaded themselves in their hotel room and covered the windows. “There are live rounds being fired all around this building. Rioters are occupying the floors right now,” said Piskunov. He confirmed that EU Foreign Ministers from Poland, France and Germany had quit the Ukrainian capital because of security concerns. They were scheduled to meet with Ukrainian President Victor Yanukovich and members of the opposition on Thursday to discuss a solution to the unrest.